Thatch on your grass is another important element to having a nice green lawn. Basically thatch is lawn debris that builds up faster than it breaks down. A healthy lawn needs to that ½ to 1 inch thick. It helps keep moisture in the soil and provide nutrients to the soil as its broken down. Too much thatch however can harm your grass. Thatch can stop water from getting into the soil, makes a great place for insects and diseases to make a home and in some cases can smother your grass and stop it from growing. The best time to dethatch your lawn is in the Spring or early Fall. This way your grass has time to recover before it gets too hot or cold. It is common for your lawn to look worse after dethatching, but after a week or two it will give your lawn the jump start it needs. When your soil is compacted and the thatch on your lawn builds up, it stops or slows down the movement of air, water and nutrients to the root system. Playing on your grass, pets, vehicles and heavy foot traffic are examples of how the soil can be compacted. Having a higher clay content in your soil also makes it vulnerable to compaction. To combat these problems you can core aerate your lawn. 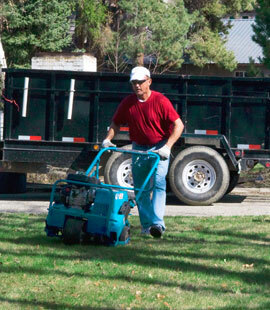 The machine used to aerate your lawn takes 2 to 3 inch cores, 6 to 8 inch apart. These new holes allow air, water and nutrients direct access to your lawns root system. The cores that are pulled out of the ground also contain micro-organisms that will help in breaking down the thatch on your lawn. These plug holes also leave spaces for your lawns root system to grow deeper and spread out, which is ideal for healthier, thicker and greener lawn. If you have tried everything to get your grass to grow thicker and healthier with nothing to show for it, it’s time to test your soil. The soil test will measure the availability of the elements to your grass. The test measures phosphorus, potassium, calcium, magnesium, sodium, sulfur, manganese, copper, zinc, PH level, and can also tell you if you water too much or not enough. The results of the soil test will tell you the type of fertilizer you need and at what rate. More importantly it will give you the PH level. For your grass to grow at its best, the soil PH needs to be 6.0 to 6.5. If your soil is more acidic or more alkaline those important elements stated above will not be available to your grass. Instead of guessing on a fertilizer, get your soil tested today and apply the right fertilizer.